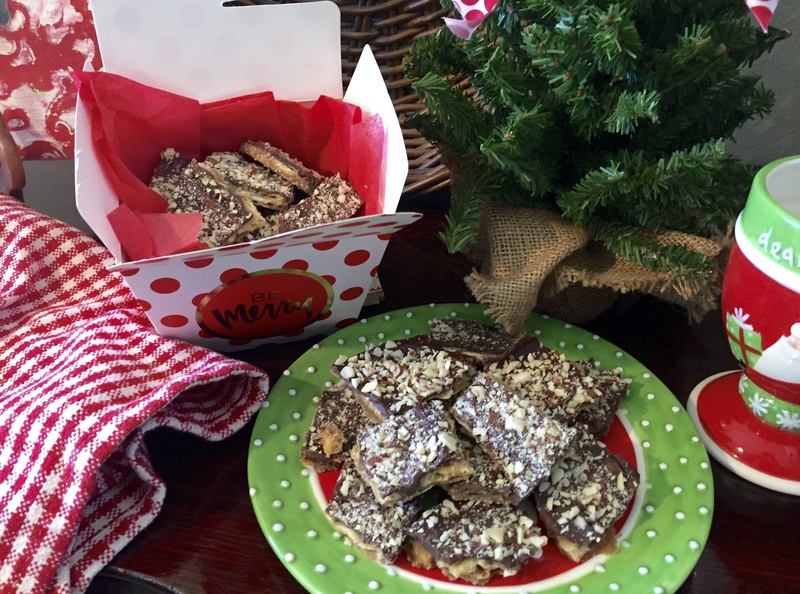 Today’s recipe is my ALL TIME favorite gift-giving, homemade holiday goodie. 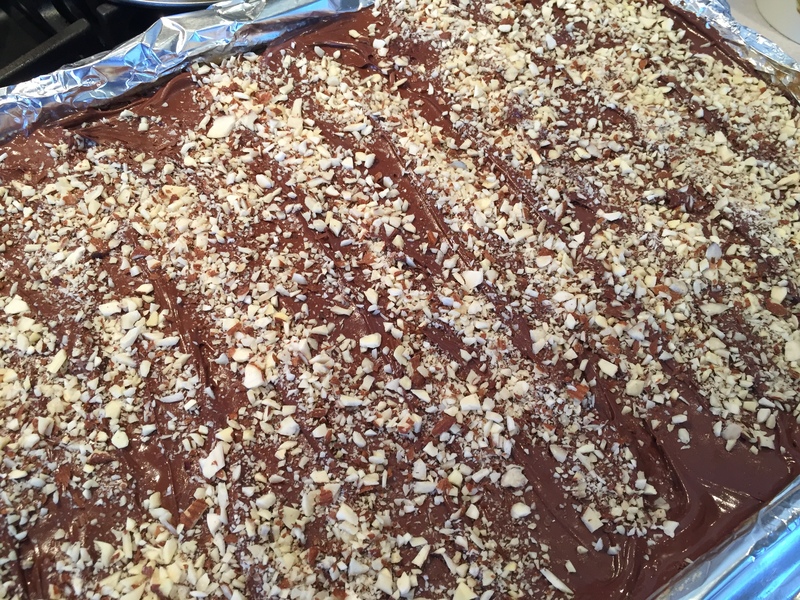 Each year I count down the days until I have an excuse for eating…oops I mean whipping up this…oh so simple yet KNOCK YOUR CHRISTMAS STOCKINGS OFF treat. Besides being very inexpensive to make, this divine goodie is a great recipe to use when you want to involve your kids in helping you out in the kitchen during this busy season. 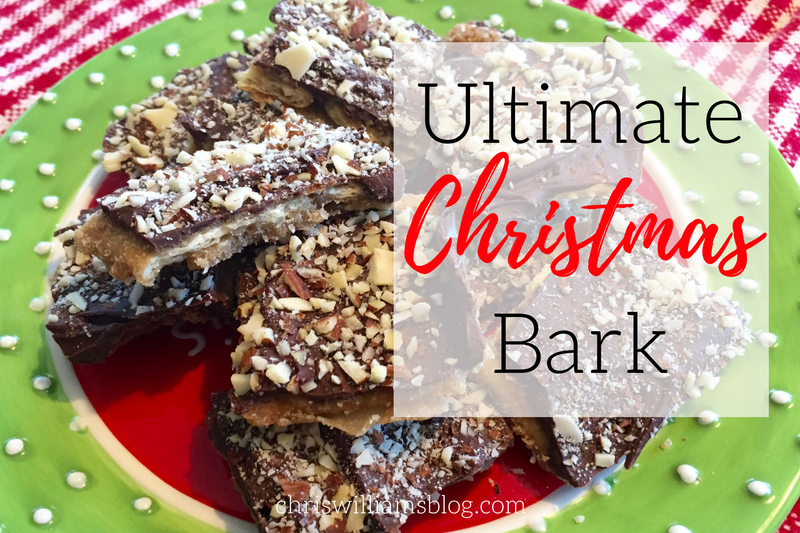 The salty crackers paired with sweet toffee and decadent dark chocolate are then topped off with finely chopped almonds which makes this ultimate Christmas bark absolutely irresistible. My kids and I like to break the bark into bite-size pieces and arrange the treats in holiday decorated take-out boxes. It’s just the right amount to give as a teacher’s gift or as a sweet way to surprise a neighbor. 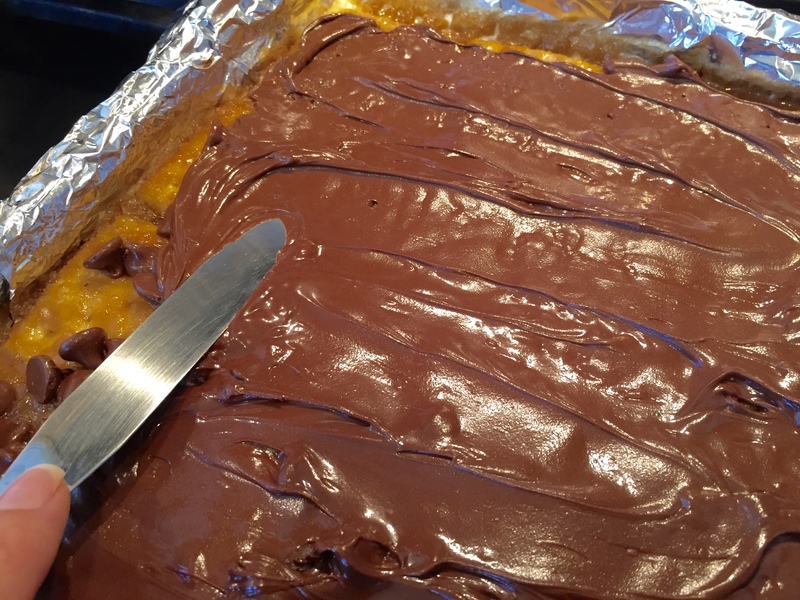 This homemade goodie has been a family favorite for years. I really can’t imagine our Christmas season without it. Also I wouldn’t want to miss out on the opportunity in sharing it with you. After all, this time of year is not only about Christmas carols and stockings hung by the fireplace, but also about sharing a bit of our hearts and what we love with others. 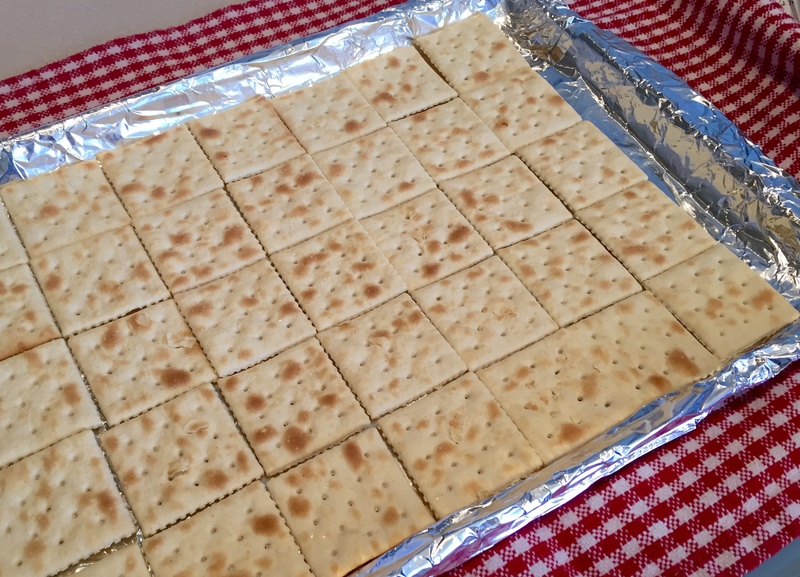 Completely cover cookie sheet in foil and line pan with crackers, salty side up. 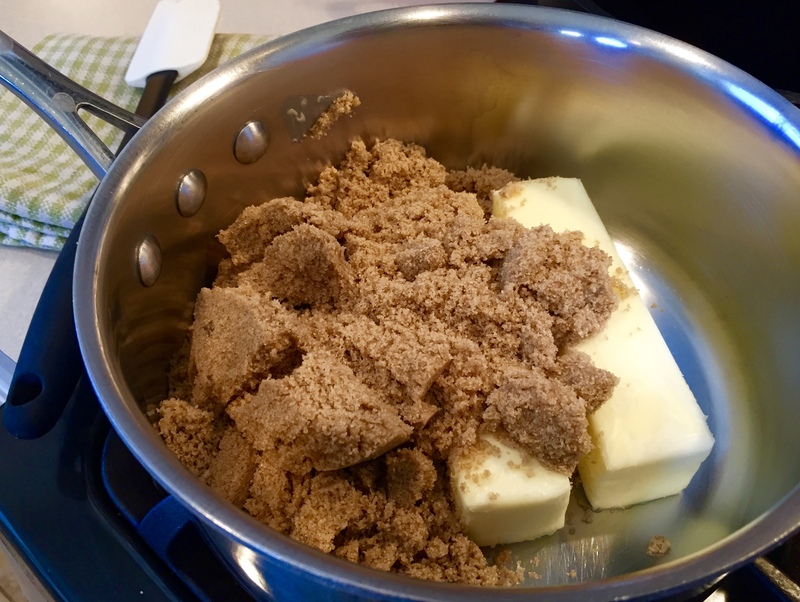 In a saucepan on the stove melt together over low to medium heat the butter and brown sugar. Stirring constantly, bring the butter and brown sugar mixture to a low rolling boil for about 3-4 minutes until golden in color, bubbly and frothy. Remove from heat and pour caramel-like mixture over crackers and spread evenly. Bake in oven at 350 degrees for 9 minutes. Remove pan from oven and sprinkle evenly on top with chocolate chips. Let pan sit for a few minutes to allow the chocolate chips to begin melting. Spread the softened chocolate chips evenly all over and sprinkle with the finely chopped almonds. Refrigerate for a few hours before breaking into bite size pieces. This looks so good, can’t wait to try it! Tots jealous of your bio photo too. Gorgeous! This is so good – looks delicious! And whaddaya know, I have all the ingredients on hand! Thanks for sharing! This looks amazing! I’d love to have some under my tree. Maybe I can make that happen!